On April 18, 1930, the 8.45pm news bulletin announced, “There is no news today.” The remaining 15 minutes allocated to news, was filled by piano music, after which a concert from Langham Place resumed. BBC producer Rob Jones, drew attention to this on the corporation’s website yesterday. How things have changed. With the announcement of the forthcoming UK election, Korea and their missiles, the Turkish referendum, Trump (of course), etc., etc., yesterday’s news programmes simply had more stories than they could effectively deal with. There was, of course, news in the 1930s, but the newsgathering technology was not as it is today. 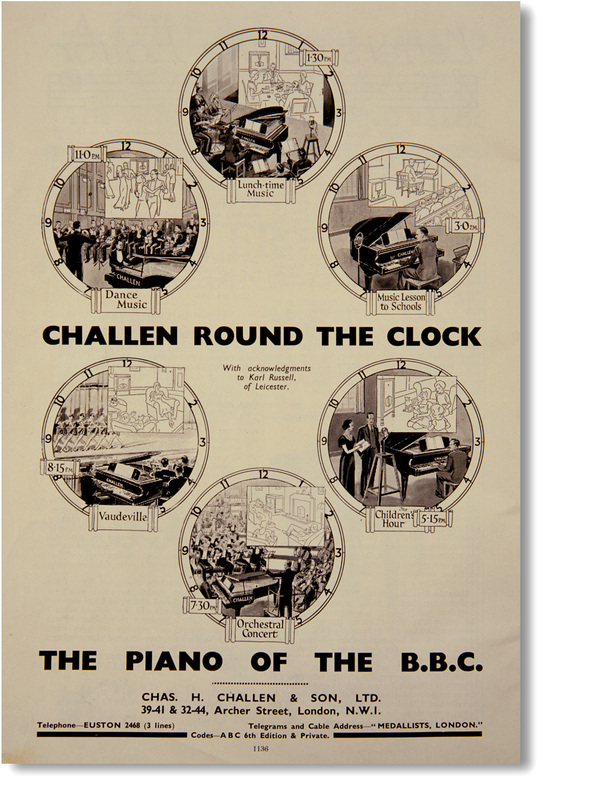 So, 87 years ago the BBC resorted to the piano as the “news filler”. In the 1930s, piano manufacturers were always extremely keen to get their instruments into high profile establishments, and no client was more sought after than the BBC. At that time Challen, Bösendorfer and Steinway all signed deals to supply the BBC with pianos. Challen in particular seized upon this opportunity to bring the sound of their instruments into homes across the country. But how would the listener know whose piano they were hearing over the wireless? Advertisements such as the one from Challen shown here made the most of the situation. Challen placed these adverts in a variety of the UK’s newspapers and magazines. They conveniently neglected to mention the presence of the pianos made by Bösendorfer and Steinway. As can be seen from the roundels, the piano was ubiquitous, and of course piano music fitted the BBC’s somewhat high brow pretensions. Nowadays, the piano doesn’t seem to have a place in news programmes. It doesn’t lend itself to snappy idents or punchy stings. But, as the advert shows, everything goes in circles! Well not quite everything. I don’t think we’ll ever hear the words, “There is no news today,” broadcast again.